New Digital Frame Lets You Zoom In On Your Pictures | OhGizmo! 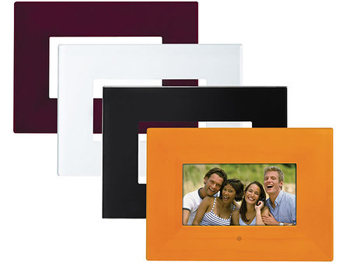 Digital picture frames were cool when they first came out, unfortunately they never seem to have a great resolution, and they are dime a dozen these days. It would be nice if someone would actually put in some features (other than playing MP3s, because no one really cares). Thankfully Polaroid has decided to do just that. Their latest digital frame will actually let you zoom in on a particular area of the picture at either 2x, 4x, 8x or 16x. Unfortunately, that’s all that’s interesting about this frame. It’s only going to display at 480 x 234, and like so many others plays MP3s. If they could have put in a better screen I might be a little more interested. Great! I’ve been looking for a digital frame that zooms.